A Terrifying World War Two setting, fully compatible with the Call of Cthulhu, Sixth Edition and Savage Worlds roleplaying games. Discover the secret history of World War Two: stories of amazing heroism, in which stalwart men and women struggle to overthrow a nightmare allliance of steel and the occult; of frightening inhuman machines which are the product of Nazi engineering genius - and how close we all are to a slithering end! The Secret War has begun! Allied and Nazi forces & Intellegence Agencies. Occult organisations and mythos-based missions. New tomes, secret weapons, artefacts & equipment. Key charactes & vile creatures. New rules and strategies for World War Two combat & survival. In fact - There's a whole shoggoth's worth of Cthulhu villainy, enough for any keeper to have his investigators dead insane, or running for their lives in no time! 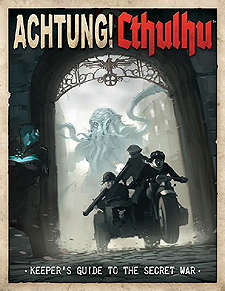 The keeper's Guide to The Secret War is the essential Achtung! Cthulhu wartime reference for any keeper or fan of the Cthulu mhythos.